Find professional Ramsey asphalt and parking lot striping when you call (201) 327-5258 today. We will set an appointment to come have a look at your parking lot and begin the process as soon as possible. Check out our money-saving coupons when you click here. One aspect that most of us take for granted when it comes to parking lots, are the stripes painted on the surface. We are mindful of “keeping between the lines” while parking and we may notice if the lines are fading or not visible, but otherwise they are just a regular part of the parking lot. If the contractor responsible for applying the lines did a good job, then it’s good that visitors take them for granted, because it means they are doing exactly what they are supposed to do. Take a look at what other people think of our asphalt services when you click here. 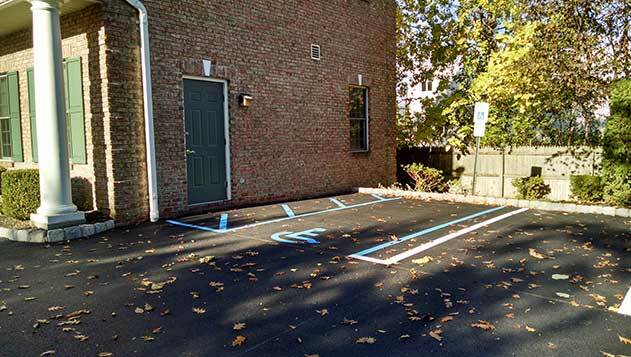 Having your parking lot and asphalt striping performed by a reputable, professional company provides several benefits. You can feel secure knowing that everything was marked out accurately and all the lines are where they should be. This enhances the safety element for visitors, reducing the likelihood of accidents and will enhance the visitor’s experience to your facility. The staff and employees using the parking lot will also be happy when it is striped by a skilled, professional company. The parking lot striping story doesn’t end with the initial application. Over time, the lines will start to fade from the sun, wind, rain and snow, and this can create a safety issue for the people using the lot. Keeping the parking lot stripes maintained is important to keep them strong and visible. Usually, the lines should be re-painted every couple of years, but if you live in an area where the elements are a big factor, it may need to happen more often. Re-painting the lines may also be required after a sealcoating application, or other asphalt maintenance. Asphalt is a very versatile material, and it is used for a variety of surfaces aside from parking lots. Some of these surfaces will also require striping, and will benefit from having professional service. They include roads, airport runways, playgrounds, bicycle paths, tennis courts, running tracks and more. If precision is important, then it’s always best to leave it to a contractor with experience and the equipment to do it right. The striping in your commercial parking lot goes a long way toward making every visitor feel safe and welcomed, not to mention boosting your reputation. Call McFarlane Asphalt at (201) 327-5258 in Ramsey, NJ and the surrounding area for expert parking lot striping you can trust.